A successful XenDesktop 5.5 Proof-of-Concept (PoC) begins with simple preparation. 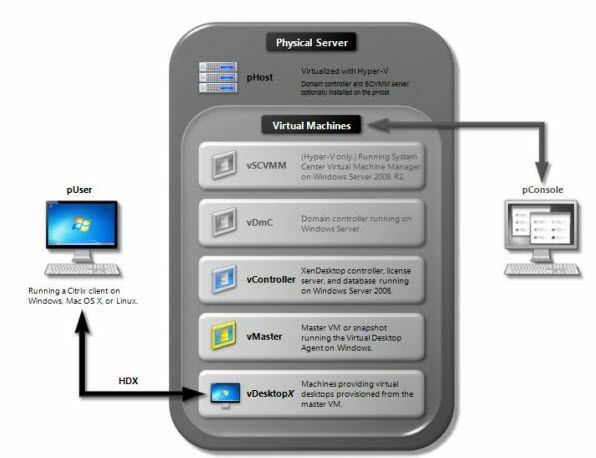 Although XenDesktop supports many different technologies and provides support for desktop, server, and application virtualization, this document focuses on a deployment of XenDesktop 5.5 using Microsoft’s Windows 2008 R2 SP1 with Hyper-V code base for delivering hosted virtual desktops. Hosted VDI virtual desktops demonstrate the brokering technology and the benefit of the HDX protocol. This level can be used to quickly compare the end-user experience and allow basic desktop remoting. This approach is good to validate user requirements with the technology. The PoC environment is expected to be isolated from the production environment, although the production Active Directory domain could be used to contain the computer and user accounts for testing. Preparation for the PoC will include hardware, operating systems, Active Directory accounts, and software licensing. Read the entire whitepaper, you can find it under Sources in this article. Enjoy /Poppelgaard.